Action Feature: Compartments open to reveal arms, retractable third leg when dome spins. 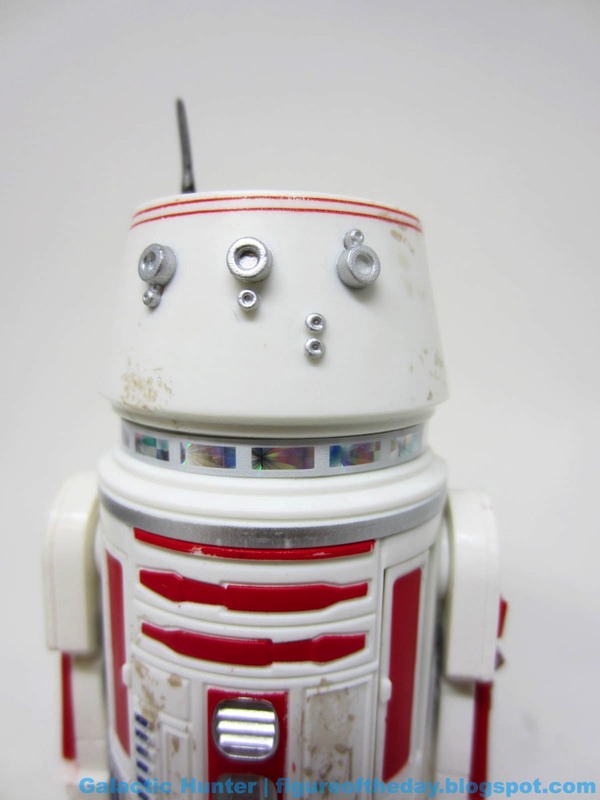 Commentary: The more merchandise we see of R5-D8, the more questions I have. We have precious little reference, most of which is either over Porkins' shoulder - and could just be the R5-D4 dome - and a small amount of merchandise. We've seen this droid in LEGO, Galactic Heroes, 3 3/4-inch, and now 6-inch formats. The coloring is rarely consistent. The game card is filthy, almost tan but largely looks like R5-D4 from what we can see. The LEGO figure looks a lot like R5-D4. 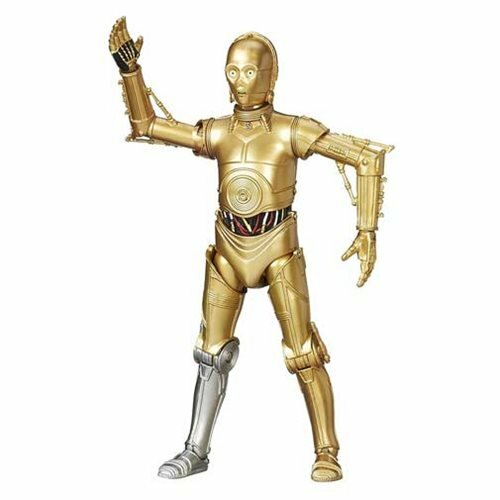 The Galactic Heroes figure is the most visually interesting, adding yellow stripes in the columns on the sides of the droid's body. 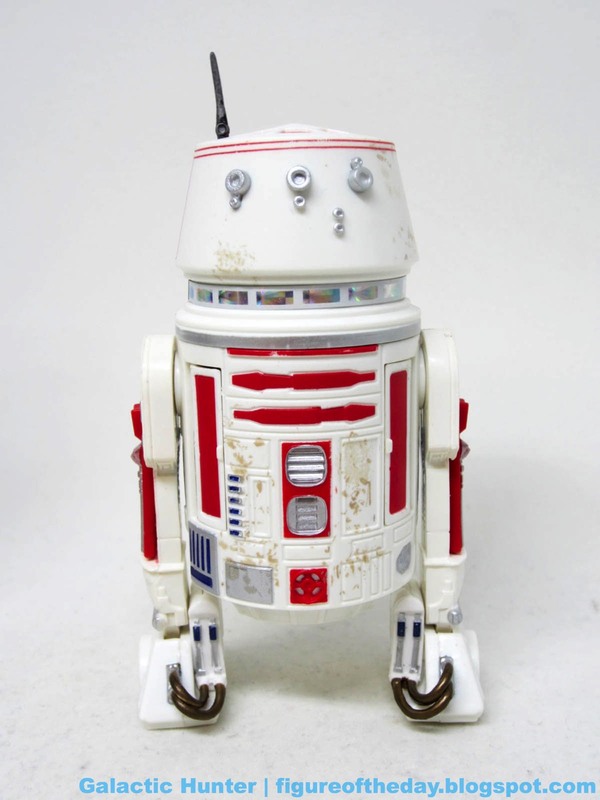 This 6-inch figure is interesting because it's basically just "vintage 1979" R5-D4 - it most closely matches the original Kenner action figure. 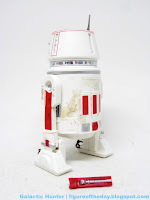 R5-D4 has no accessories and is basically a redeco of last year's vintage 40th Anniversary R5-D4. 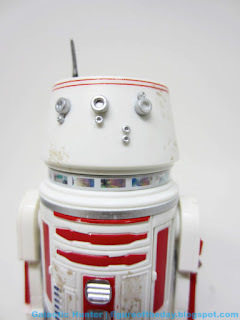 The figure replaces all the blue R2-D2 panels with red ones - R5-D4 has a few blue panels on his person, and Lucasfilm apparently has made zero effort to keep them all consistent. It's a department that needs a bunch of annoyingly fastidious little dorks (why don't I have this job?) comparing any and all products to previous reference material and products, and that doesn't seem to happen. Someone said "good enough" and called it a day, meaning that most likely this figure is not accurate to the closest thing we have to a body reference photo - the trading card game. That figure has blue directly below the dome, on the top of the body where the "chest" would be. This one is red. Everything else is kind of a toss-up - from that trading card to R5-D4, there's minimal if any discernible difference. The comics don't always get it right either, so I don't blame everybody - but it'd be nice to see more effort to getting it consistent if it can't be correct. And again, I don't know for sure what "correct" is. If you compare it to that old Kenner figure, this is pretty darned close. 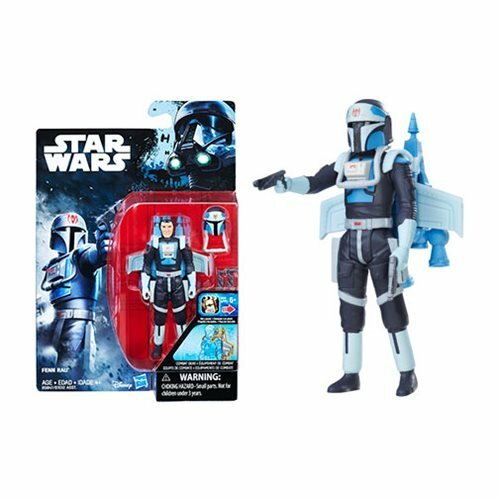 It's also pretty close to previous releases of the mold, I'm surprised Hasbro didn't glue down the arm panels as that functionality isn't important to this figure, and Hasbro was fond of gluing down panels on the smaller figures. 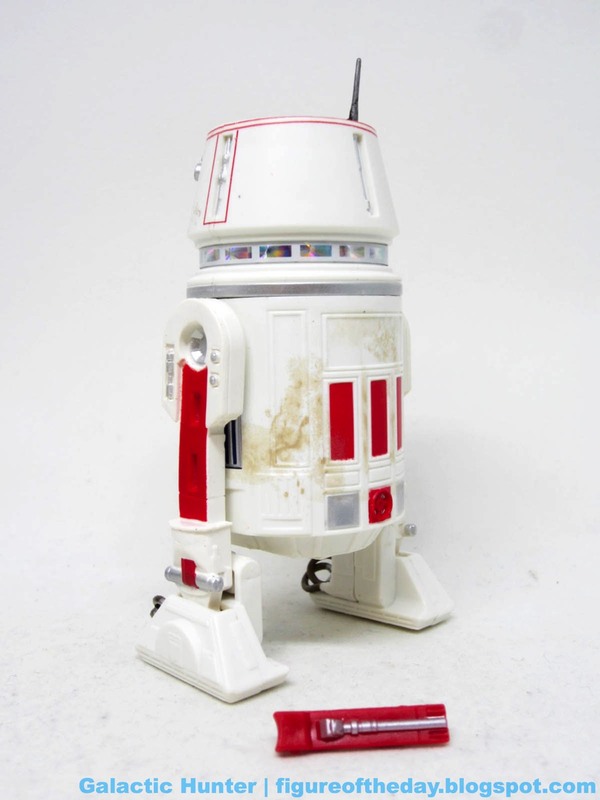 This figure more or less serves as a "vintage" R5-D4, but with added dirty splatter in spots. 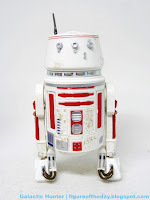 It's neat - it's a fine substitute for last year's R5-D4 if you missed it. However, the boxed set isn't a great value. 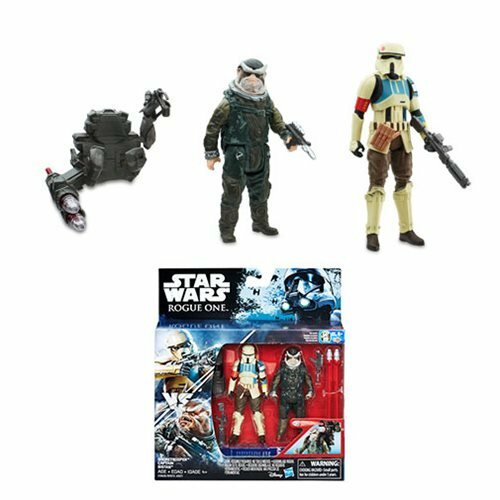 It's expensive - $60 for 3 short figures - with fewer accessories than the Toys R Us 3-pack which was $55.99. I'm sure this one will get marked down with time, and while I would normally be an annoying advocate for paying full price for things you want to support... well, OK, let's not change that. But having six Red Squadron droids and only one pilot kind of irks me. I'd like a second pilot before we see another set of droids, or any Death Star-adjacent Rebel robots. We know it's inaccurate, but not how inaccurate. If you are interested in a robot that's good in and of itself, go ahead and snag it. It has the opening compartments with the claws, the retractable third leg, and the same articulation.